Human instincts and desires fascinate me, particularly the way we tend to distort our perception and projection of them through layers of social and personal constraint and inhibition. The directness and honesty of animals’ behaviors in my work—sometimes sexual, brutal and violent, sometimes innocent, loving, and playful—brings into relief our convoluted and self-conscious psychological and emotional landscape. 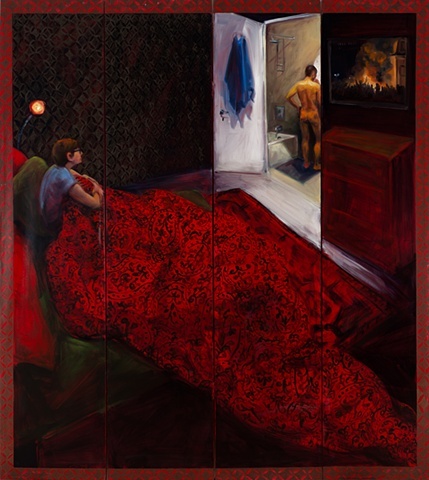 Frequent themes explored in my work are the interplay of innocence, vulnerability, playfulness, and aggression, our search for connection, and our struggle with alienation. An extension of my painting and sculpture practice, my newer work migrates the animal imagery onto the body itself—our bodies—in the form of jewelry. I use precious metals and gems in these pieces, taking the relationship between the brutal and the decorative seen elsewhere in my work to its logical extreme. The viewer becomes an integral part of the piece, as the wearer. My work is intended to function as a direct communication with the viewer, or the wearer. I want it to evoke an initial response that is visceral and immediate—attraction, repulsion, recognition. Jessica Hargreaves is a fine artist, originally from London. Her career began in fashion upon graduating from Central Saint Martin's School of Art. She worked as a designer and illustrator for companies including J. Crew, Liz Claiborne, TBWA, Grey and The Martin Agency. She then went on to get her MFA from The Art Institute in Chicago in 2006. Jessica currently lives and works in New York.